The Texas Softball squad starts the spring season Friday hosting the Texas Classic (Photo courtesy of Texas Sports). AUSTIN — Texas starts the spring season with so much softball it takes a whole weekend to capture it all. 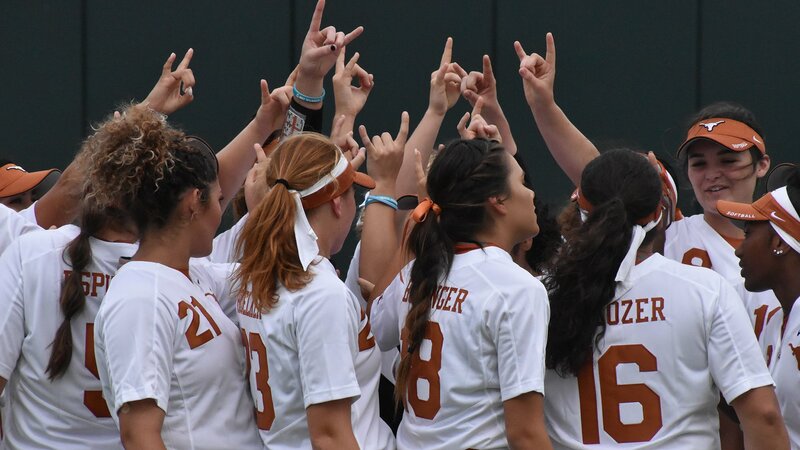 The Texas Softball team kicks off the 2019 spring season Friday here in Austin, hosting numerous schools as part of the Texas Classic going on Friday through Sunday at Red & Charline McCombs Field. Under new head coach Mike White, there are still plenty of expectations for the Longhorns — internally and externally — as Texas slots in at No. 16 in the preseason rankings. On top of that, Softball American named three Longhorns to their inaugural Top 100 National Player Rankings — No. 13 Miranda Elish, No. 17 Janae Jefferson and No. 57 Shannon Rhodes. With White at the helm, Texas expects to content for a national title once again, starting this weekend. Texas returns plenty of talent from last season — including junior outfielder Kaitlyn Washington and redshirt junior Reagan Hathaway — while infusing plenty of new-to-Austin talent that combines for a formidable squad this season. White, who comes from coaching at Oregon, embraces the expectations and is doing his best to make the pitching staff stout, as he’s a former pitcher himself. From there, reducing strikeouts and creating an active, yet intelligent, approach throughout the lineup was a big focus for the ‘Horns during the offseason. Fans will have a chance to see the new Longhorns in action five times over the course of this weekend. Along with a different approach and style, White also brought four of his former players along with him to the Forty Acres. Elish, who went 25-2 last year and was a NFCA All-American, is joined by sophomore Lauren Burke, junior Shannon Rhodes and sophomore Mary Iakopo, all of whom come with accolades of their own. Burke, a utility specialist, was named a Pac-12 All-Freshman last year, Rhodes was named NFCA All-Pacific Region and Iakopo, a catcher, was a Pac-12 Second Team honoree as well as a Top 25 finalist fo the NFCA Freshman of the Year award. Check back throughout the weekend for more on this year’s softball squad and updates from the diamond. The games begin at 11 a.m. Friday with Texas taking the field for the first time this season at 4:30 p.m. The Longhorns play back-to-back contests, first taking on Northwestern State before playing Boston College at 7 p.m. Friday evening. From there Texas plays again on Saturday afternoon vs. Boise State at 1 p.m., and plays another back-to-back while taking on Boston College again at 3:30 p.m. Saturday. The tournament concludes Sunday with Boston College vs. Boise State at 10 a.m., and the finale featuring Texas hosting Northwestern State at 12:30 p.m. All games will be televised on the Longhorn Network. Furthermore, all University of Texas students get free admission to the softball season opener Friday at 4:30 p.m. against Northwestern State.